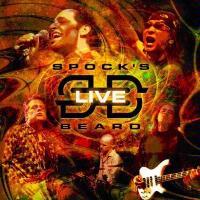 I have to admit, I haven’t seen Spock’s Beard live since the departure of Neal Morse. While this wasn’t a conscious decision, I have to admit to some trepidation about how the band would sound without their former front man. Well, I should not have been worried. This live album, and accompanying DVD, show that The Beard is every bit as strong a group now as they were then. And they still rock with the best of them. In fact, I might actually go so far as to say that Spock’s Beard is the best of the pack of newer progressive rock artists. They sure deliver when it comes to live performance. If you want to check out their live set but haven’t had the chance to see them, get the DVD. But if you want something to listen to where a TV isn’t available, you must own this CD set. Drums leads us in. In fact, this is essentially a drum solo to get everyone in the spirit of things. Hard edged guitar is accompanied by vintage keyboards in a pounding progression. They work it to the more melodic as alterations. It eventually (after some cool keyboard work) drops down for the verse structure, a very balladic one. After a time it powers up for a smoking chorus and then we move out into a killer prog instrumental section complete with some great keyboard work and cool drum fills. This is a class act all the way. They take it through a number of other changes and each instrument seems to get a chance to shine. The beauty, though, is the fact that they never lose sight of the song. Bouncy and quirky sounds lead us out. They drop it down to piano and voice and then fire back out from there. After a time this is moved to a lush, melodic section and then a change or two ensues in that general manner. This gives way to the song proper and they continue by repeating these sections with variants. There is a killer instrumental section on this cut. Working through a number of changes in the introduction alone, this is such a cool prog rock piece. It represents the best of the modern, non-metallic progressive rock, while still feeling like it could have come out of the 1970’s. They work between mellower motifs and harder rocking jams and even include a bit of funk in the mix. The chorus hook is strong and we get some great instrumental work on the piece. Interestingly, I’d have to say that the guitar solo segment around the eight minute mark reminds me a bit of the Grateful Dead at times. Of course, when they shoot out from there in the more group oriented jam that image is shattered and it feels almost more fusion-like. This is a slower moving number that’s quite balladic. It’s perhaps a bit like Porcupine Tree meets Genesis – how’s that for new meets old progressive rock? The instrumental segment soars out and is a strong one. We get some killer guitar work on this before it ends. Actually a track from Alan Morse’s solo CD, they bring this one in with a quick pace and harder edge and it reminds me a bit of the Dregs at times. They work through for a while on this and then seem like they might be ending it. Instead the Dave Meros’ bass fires out into a killer new progression and the track becomes even more fusion oriented. This cut more closely resembles neo-prog because it’s quite metallic. There are some incredible riffs on this and the vocals are among the best on the set. Although this might be one of the most metallic tunes done here, it’s one of my favorites. It just smokes! Here we get another progressive rock powerhouse. This is yet another place where the Beard show off their range of musical talent and their sheer energy. Everyone really gets a chance to show off here, but I’d have to say that perhaps Dave Meros’ bass and Ryo Okumoto’s keys steal the show more often than the rest. There are some fusion-like sections on this piece. I have to admit, I’m not a drum fanatic. Drum solos sort of seem a waste of time to me. That said, I think my favorite drum solo of all time was the duel between Alan White and Bill Bruford on Yes’ Union tour. Well, this shares some things with that in that we have two drummers (Jimmy Keegan and Nick D’Virgilio) playing together and off of one another. It makes this work quite well. I wouldn’t say it tops that other solo – mostly because that one had the counterpoint of White on acoustic and Bruford on electronic kits – but this is one that I enjoyed.Coming from me, that's high praise for a drum solo. Keys start this off in dramatic ways. When the rest of the band join this is just incredible. It reminds me somehow of a prog version of some spy movie soundtrack. 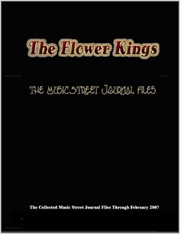 They work through a series of changes and alterations as they carry on. It’s a total thrill ride from beginning to end. Some of the later portions of this remind me quite a bit of ELP. The trademark Spock’s Beard progressive rock is continued with another killer track here. These guys have such a talent for putting all kinds varying musical structures and textures into one cohesive piece of music. The real talent, though is the fact that the songs are still catchy and meaty at the same time. This is another classic example of that. Anyone who’s ever seen Spock’s Beard live can tell you that keyboardist Ryo Okumoto is a crazy man in live performance. He’s funnier than you can imagine. The thing is, as this solo will attest, he’s also a great keyboardist. He plays it fairly gentle and melodic on this one. The first portion of this epic is essentially in a progressive rock ballad format. It’s a great piece of music and has some nice mellow segments. When they shift out into the next movement, it’s a jazzy sort of jam. This is faster in pace and a bit grittier. It’s also meatier. You might hear some sections here that call to mind Zappa just a bit. There is a cool retro keyboard solo on this, too. This moves out into a catchy chorus as we move into round three. This is so close to being a classic pop rock song. It’s just the kind of thing that gets you wanting to sing along. That’s exactly what the audience does later. When they take us out into this one it’s with a soaring jam. This is one of the more dynamic portions of this epic. It works its way through a number of changes and alterations and still manages to please all the way through. This comes in rather sedate and understated. It grows up to the soaring chorus and then the band take us out on a powerhouse musical adventure. It becomes a rather metallic screamer after this short instrumental segment. They take us through a series of changes as the song is “rearranged.” It is turned into quite the powerhouse with a soaring guitar solo before they take it out. This is old school Beard, coming from The Light. It’s also a scorching song with fiery sections of music coming and going and dramatic vocal segments counter-pointed mellower motifs. I’ve always liked this a lot and I’d have to say that this live version is awesome. Coming from the same album, this is another of my personal favorites from The Beard. As performed here it is a smoking, jazzy piece that features some incredible instrumental work. The way it resolves out into a triumphant vocal segment and then beyond is simply awe-inspiring. I simply can’t picture a more satisfying conclusion.